Tucker Carlson defends Steve Bannon by saying he's not ISIS. Now it's a meme. Last week, USA Today published an editorial comparing White House Chief Strategist Steve Bannon's worldview to that of Islamic State. 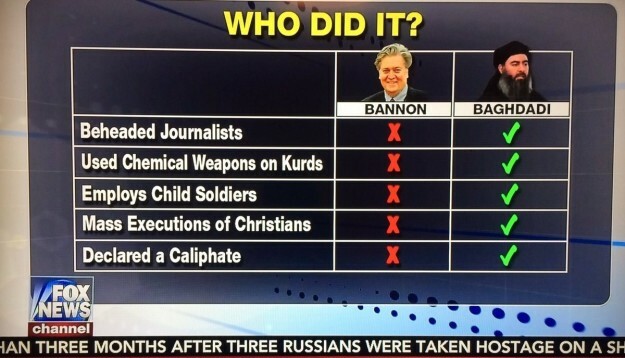 Tucker Carlson Tonight, Fox News' primetime program, went on the defense, taking the thesis oh-so-literally and presenting a pretty convincing chart as to why Bannon and ISIS might be separate entities. 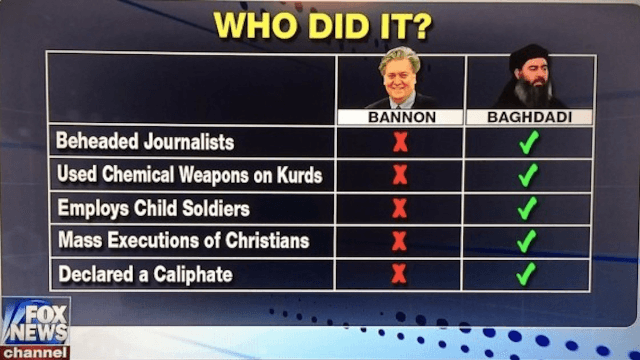 Unlike ISIS leader Abu Bakr al-Baghdadi, Bannon has not beheaded journalists, used chemical weapons on Kurds, employed child soldiers, mass executed Christians, or been declared a caliphate. Therefore, he must be an angel. Twitter quickly made their own charts for future Fox News broadcasts. People made a point to point out some similarities. There's no higher praise for a person than simply "NOT ISIS." Yes, this is all really happening.